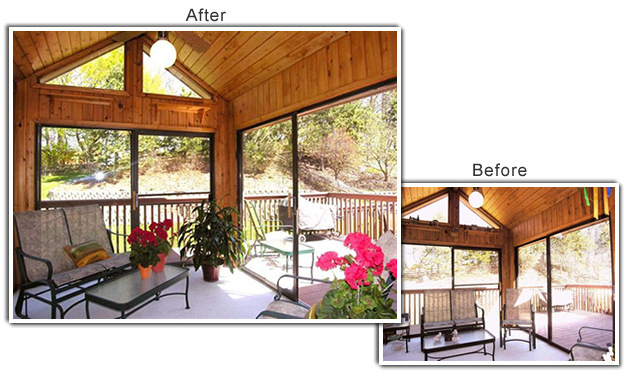 The Project: A sunroom in Eden Prairie. What Worked: A large outdoor deck and a great back-yard view. What Didn't: Lack of color and a bland furniture arrangement. "It's tough to get excited over a sunroom that overlooks bare trees and a dead lawn," said Lori Matzke of Centerstagehome.com. Knickknacks on the upper shelves and coffee table, and a decorative banner hanging from the ceiling were removed. To draw the buyer's eye to the outdoor views and deck and to create a sense of depth in the room, furnishings were deliberately angled about 10 inches away from the walls in opposite corners of the room. To visually extend the size of the space to include the back yard, Matzke moved one of the chairs and a side table onto the deck. Silk throw pillows tossed on glider and chair (not shown) dress up patio furnishings by making them feel less transitional, while creating continuity in colors between adjoining rooms. Bright potted geraniums and a large plant add lively color to the space and make it feel more summery.